This World Wildlife Day, which this year has the theme of #ListentoYoungVoices, I want to encourage everyone to #DoOneThingToday to help become part of the solution. Check out this map of World Wildlife Day events you can join. IFAW will be participating in awareness events in France, China and the United States. I am particularly thrilled to promote the new Youth for Wildlife Conservation network this World Wildlife Day. Y4WC is an organization run by youth, promoting youth that will bring much needed energy and innovation to the conservation movement. The extraordinary young conservationists in this organization first came together last September for the first ever Youth Forum for People and Wildlife in South Africa (#Youth4Wildlife), convened by the International Fund for Animal Welfare (IFAW) in the days leading up to the Convention on International Trade in Endangered Species of Wild Fauna and Flora (CITES) Conference of the Parties. 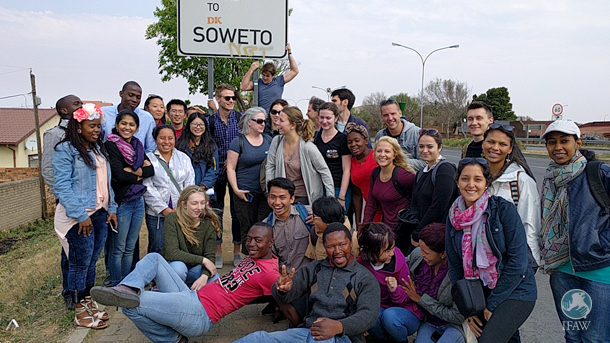 Thirty-four young people from 25 different countries came together to learn, share ideas and engage in thoughtful, respectful debate with each other and with established conservation leaders from my own generation. I knew when I met them that these young people would go on to do great things. I was delighted to support them in the establishment of their own network to continue the collaboration that started at the Youth Forum. Empowering youth is a first step. Older people, the people and institutions in power today, from government and corporate officials, to parents and teachers must listen. And learn. And become part of the solution. People in power must LISTEN to proposed solutions from the young, ADAPT their ways of doing business and economics that protect wildlife and natural resources, and IMPLEMENT the laws, regulations and economic/cultural shifts necessary to secure the future. Given the global challenges we face, from international wildlife trafficking to massive extraction and destruction of wildlife and habitat by multinational corporations, young people must transcend old ways of doing things: work across borders, cultures, classes, religions and oceans to protect and preserve life on Earth. As CEO of IFAW, I am committed to building a better world for animals and people, and I know that this is only possible if those of my generation, established in our leadership roles, listen to young voices, and support and encourage them to help build this new future. No matter your age, I encourage everyone to visit and support Y4WC, join their network, join IFAW’s network, join in the movement to build a better world. On World Wildlife Day, there is something all of us can do to become part of the solution.